December 2011 – Finding a new "normal"
The last week of the year is awkward. It’s hard to plan anything since so many people are still traveling. For working folks, it’s often a “wish-I-was-anywhere-else” week since little can be accomplished due to the absence of so many others. Should be a great week for thinking back on a good year, right? Maybe. For someone who claims to love to reflect, I risk conveying a sense of contradiction or else the after-Christmas blues with the picture I’ve painted of this week. Perhaps it seems awkward precisely because it is only one week. With all the focus on Christmas festivities through December 25th, we really only leave ourselves that one week-between-the-big-holidays to think about the year – and surely we need more time than that to process where we have been over the past 365 days and where we would like to go from here. Perhaps it isn’t the week itself that is awkward, but is instead the things we Americans tend to hold in focus. Inevitably, the media will spend the week rehashing the best songs, the best movies, top videos, and best gadgets of 2011. We will also assuredly be reminded of those beloved stars and otherwise-famous people who died this past year. I suppose all of those things are suitable ways to reflect on a passing year. I, however, (predictably) would prefer to focus on other things in assessing the year. The first obstacle in any act of remembering for me is the most obvious: my memory. I can’t remember what I ate for breakfast this morning, so how could I possibly remember the year without some reliable support? Perhaps the new Facebook Timeline could serve as a way to track the year. Of course, I would have to read between the lines and somehow remember the things that were not published – you know, the things that were not happy enough, witty enough, or interesting enough to use as status updates. Helpful, but not entirely sufficient. The next gauge would probably be one of quality time spent with family and friends. How many memories (hopefully documented in pictures or other keepsakes) were made this year? More than ever, I am beginning to value pictures that capture special days or moments. While it is not possible to document every special moment with digital photography, every special time deserves some sort of keepsake or marker. To add interest to your measuring efforts, try asking your family and friends what they remember the most. You may discover that what they remember and value the most is not what you remember or value! The next thing that I would want to consider is how well I spent my creative energy. Have I made steps toward God’s calling in my life? Have I produced anything to benefit others beyond my self or my immediate family? Have I even worked at all toward some specific mission or goal that is Kingdom-focused and altogether bigger than me? Of course, it couldn’t hurt to consider these things more often than once each year – particularly the goals/creative energy aspect. We would do well to keep that one on a daily prayer cycle and quarterly assessment! Can you imagine how effective we could be with that kind of focus?!? With this process in mind, I challenge you to create your own “best of” lists for 2011 and make a supporting list of goals for 2012. 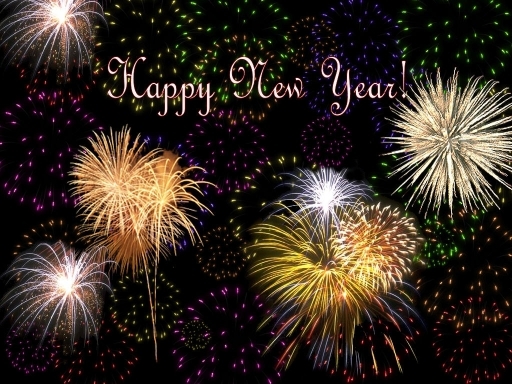 Let’s all set aside extra time to pray and write down what we hear God saying about this new year, then turn those leading words into our personal gameplan for 2012! This could be the most important week of 2011. I must confess that I embarrass myself. Any time I attend an event that precipitates applause and I am part of the audience, I cannot contain my tears. I mean, my throat lumps up, my facial muscles contract, and the tears start rolling. If the performance is in a darkened auditorium, I fare better than if I am in a well-lit stadium. If my children are with me, they are always the ones to ask if I’m ok – God bless them – but I’d rather not have to explain why I’m crying. Tears unrelated to pain or sadness are more difficult to explain anyway, aren’t they? Why do I cry when something strikes my “happy chords” just as easily or as much as when I feel hurt or just plain sad? Of course, curious minds turn to Google. As I researched this question I learned another tid-bit that I could link to my most recent embarrassing cry. This week as I attended (and cried at) Raleigh’s special version of “A Christmas Carol”, I noticed that my right eye cried first. I have since read that when the first tear comes from one’s right eye, it allegedly signals happiness while a first drop from the left eye signals sadness. For reader-friends who share in my curiosity, it seems that we don’t really know the answers, but we can comfortably relate to some of the facts about tears. Tears are, in general, in three distinct categories: basal, reflex, or emotional. Basal tears simply keep our eyes moist. Reflex tears respond to environmental stimuli such as onions. Emotional tears are the most peculiarly human type – although there is some debate about whether chimps cry emotional tears or not. Apparently, there has been some “research” (I only add quotes because I did not read the study but only a brief description of the results and do not know how scientific it actually was) to determine if there is a chemical difference between sad tears and happy tears. For the sake of brevity, suffice it to say that happy tears consist of brine and not much else, while sad tears contain hormones and chemicals that are toxic in the body and thereby can be understood as a physical mechanism for protecting the body from negative emotions and their nasty chemical by-products! Others argue that all tears are the same and that so-called “happy tears” are in truth a stress-relief response from built-up negative emotions such as fear or worry. So, my Googling expedition didn’t really satisfy all of my curiosity, as is typically the case. We can know some of the things that define our humanity, but so much is still speculative. There is a piece of this puzzle, though, that seems to be a pretty solid observation: our tears communicate. They communicate the content of our hearts – what we acknowledge and what we hide. Tears bind us in compassion for one another as we are made vulnerable by their revelation. Tears are a spectacular part of our design! Tears not only bind us together as people in community, but they serve to bind us in the sense of binding a wound to promote healing. I remember during the years when reaching the milestone age of 100 was just becoming commonplace, centenarians were asked for their secret to longevity. I don’t remember any of them ever attributing their long life to lots of good cries, but I’m betting they shed their share of tears. I suspect we all have times when we feel embarrassed by our tears. Even my very-young son has sensed the cultural pressure that boys should not cry. I say that notion is hogwash, by the way, and I urge my sons to cry when they feel the need to drain their eyes. Jesus cried, after all: “Jesus wept.” John 11:35. Perhaps we should all just embrace our very human tears and keep the tissues handy at all times, because you never know when you’ll need one, or when you’ll have an opportunity to offer one to a neighbor! 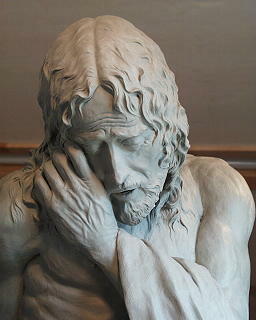 *“Jesus Wept” is a life-size, original clay sculpture by Mike Scovel.